Recently, I stumbled upon this question. Honestly, it’s something that I think about regularly when I’m planning a trip to a national park. While people frequently visit parks and other protected areas to experience unique and special landscapes, sometimes we fail to see their forests for the trees, or even see their forests at all. I think this is particularly true of North Cascades National Park and the adjacent recreation areas, Lake Chelan and Ross Lake. The region is most famous for its rugged mountain topography, which I must admit is quite pretty, but visiting here solely to see mountains risks missing some of the best, uncut forests left in the Pacific Northwest. I’m not implying that a visit to a park without admiring trees is somehow less worthy than my slow forest strolls. Far from it; national parks mean different things to different people. But, I find myself drawn to trees, no matter where I go, even among some of the Lower 48’s craggiest mountains. The North Cascades are defined by their ruggedness, and the area’s vertical relief is impressively steep. Ridges and mountain peaks frequently rise above 7,000 feet while deep valleys incise the landscape to near sea level in some places. The Skagit River at Newhalem, for example, flows at 500 feet in elevation while several peaks ascend over 5,000 feet within a few miles. In Stehekin, Lake Chelan sits at a modest 1,100 feet above sea level, but within two and half horizontal miles of the lakeshore, Castle Rock reaches above 8,100 feet. Castle Rock rises 7,000 feet above Lake Chelan. The rugged topography slowed the march of industrial logging into the mountains, so by the time the North Cascades National Park Service Complex was established in the 1960s and 1970s, much of the forest within the newly protected area had never been logged. In the park today, nearly every low elevation valley holds wonderful examples of wild, unmanaged forests. Some of the most spectacular and significant trees are found along Big Beaver Creek, which flows southeast into Ross Lake. A section of trail about five miles from Ross Lake passes through a grove of thousand year-old western redcedar. Preservation of these trees was the catalyst that stopped the expansion of Ross Dam. Some western redcedar in the Big Beaver valley are over three meters in diameter at chest height. Along their entire length, both the Big Beaver and Little Beaver valleys harbor incredible forests. The same goes for the Chilliwack River valley and Brush Creek area, so if you hike from Hannegan Pass to Ross Lake, you’re in for a spectacular forest hike. Yours truly and a large Douglas-fir at Graybeal Camp in the Brush Creek valley. Those places are remote, however, requiring most of a day’s hike just to get near them and several days of backpacking to traverse the valleys. Many other old-growth forests are more accessible. The Stetattle Creek Trail, which starts in the Seattle City Light company town Diablo, ends in a classic example of a climax forest on the west side of the Cascades. This trail is often overlooked and rarely busy. What it lacks in mountain vistas it makes up for in trees. Hiking south from the Colonial Creek Campground, an easy four-mile round trip along Thunder Creek brings you through stately Douglas-fir and western redcedar. People often march through this section, barely stopping to look, as they have their sights set on up-valley destinations, but if you go plan some extra time to stop and admire these trees. Disturbance—whether brought by fire, avalanche, landslides, or people—is a hallmark of this ecosystem as well. Many large trees stand as witnesses to past and current change. Those that didn’t survive allow us to explore how the ecosystem may cope with future disturbance. I find myself pausing frequently in burned areas and avalanche tracks to admire how quickly the landscape can change. Avalanches can sometimes devastate otherwise healthy stands of trees. This example comes from the upper Brush Creek valley. Often overlooked and visited far less than the Highway 20 corridor, the Stehekin valley is the most diverse place in the park complex, both in terms of cultural and natural history. In Stehekin, you can find everything from a historic orchard to plants adapted to desert-like climates growing alongside old-growth groves. Vine maple splashes the Stehekin valley with color each fall. Trees persist and even thrive despite the forces constantly working against them. They create vertical habitat, greatly increasing the landscape’s capacity to support life. They tell tales survival and struggle, longevity and adaptability. They are living witnesses to history and catalysts for conservation. North Cascades provides a rare opportunity to explore unmanaged, old forests—habitats that are becoming increasingly rare. And, if you can’t get here, just go to your local park or maybe even your back yard where, I bet, there’s a tree worthy of your attention. Last year, Isle Royale National Park released a draft plan to determine whether and how to stabilize the park’s wolf population. After evaluating the merits of several alternatives, weeding through public feedback, and with only two wolves remaining, the park has decided to introduce 20-30 wolves over a three-year period. In the park’s decision, managers have affirmed their belief that wolves on Isle Royale are an irreplaceable part of the ecosystem, and their loss is unacceptable. Parks are being increasingly managed for change, but the myth of national parks as static vignettes of primitive America remains pervasive. As I wrote on this issue last year, parks are not pure. We live in an era of unprecedented change, and situations like Isle Royale’s will only become more common. The National Park Service has made strides toward acknowledging that parks will change, but it’s time to put a greater effort into planning for it. To help the public better understand the dynamic nature of national parks and their significance—what we’re willing to save and what we’re willing to let go—there should be an effort across the NPS to identify at-risk resources and decide whether to protect them. Resources to protect would be species, habitats, and processes that if lost would impair the significance of the park or reduce biodiversity. This could help guide current and future management of parks, leading the NPS to implement preventative or prescriptive actions to stave off unacceptable impairment instead of waiting until it’s nearly too late. In areas with endemic or endangered species—such as Hawaii Volcanoes, Haleakala, and Channel Islands—it may be most appropriate to manage against change to mitigate the risk of losing unique habitats or species to extinction. The nene, or Hawaiian goose, only lives on the Hawaiian Islands. National parks like Haleakala and Hawaii Volcanoes provide it with important habitat. The island fox is endemic to Channel Islands National Park. It is one of the smallest canids in the world. The largest tree on Earth, by volume, is the General Sherman tree in Sequoia National Park. Sequoia trees are endemic to small groves in the western Sierra Nevada. Only one specimen of Hibiscadelphus giffardianus was ever discovered. The original tree died in 1930. Luckily seeds from the last plant were collected and propagated. Now over 200 individuals of this species are growing, but it is only found in Hawaii Volcanoes National Park. In other areas where forest compositions will shift, it may be more appropriate to let change happen as long as native biodiversity is protected. In Katmai National Park, shrubs and trees now grow at higher elevations compared to 100 years ago. Should this view be protected or should tree be allowed to encroach on the scene? At North Cascades National Park, tree line is expected to rise in elevation which may threaten views like this one near Cascade Pass. Forests in this park, especially at low elevations, are also projected to burn more frequently under a warmer climate. Importantly, this planning effort could help the public better understand decisions like Isle Royale’s, which seems inconsistent and arbitrary to many people who commented on the plan. Biologists predict wolves will be extirpated from Isle Royale within a few years without direct intervention, but why intervene on the behalf of wolves at all? Wolves, as a species, don’t need Isle Royale to survive. As the NPS reasons, it’s less for them, and more for the park. Without wolves climate change would have a greater influence on the archipelago. 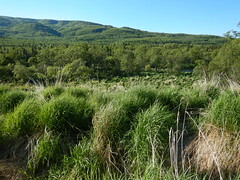 Plant communities would shift dramatically under heavy browsing pressure from moose, causing a cascade of effects and perhaps, according the park’s Final Environmental Impact Statement, become less resilient. Scenarios like Isle Royale’s will only become more common as we continue to fragment habitat, introduce invasive species, and change the climate. Not that I want it to be this way. Ideally park ecosystems would remain healthy enough and function normally enough so native species and biodiversity are protected without our heavy-handedness, but unless we shift our priorities dramatically then we’ll find ourselves stepping in at ever increasing rates. We can no longer afford to think of parks as museums. What exists in them exists because we, directly or indirectly, choose it. In the face of unprecedented change, national parks cannot remain static. It wasn’t feasible in the past and it’s increasingly infeasible now. Where do we draw the line and how do we intervene? That’s something we need to decide right now—nationwide, collectively, and not in a piecemeal manner. Author’s note: Over ten years ago, I wrote this essay about my cycling experiences at Death Valley. In it you may notice a bias against car travel because I wrote it for a cycling audience in mind, particular those who travel by bicycle. I even pitched it to a cycling magazine (they liked it but needed more quality photos). I continue to ride my bicycle a lot, and I highly encourage everyone to do so (it’s better for you and the Earth), but over time I’ve come to realize that I should be less judgmental of people who experience parks in different ways than me. Still, I chose not to edit this essay—even though it could certainly use it, especially stylistically. With that being said, here it is, unadulterated and unedited. I had never been anywhere this windy. I was out for a leisurely overnight trip from Furnace Creek in the heart of Death Valley to the town of Shoshone and back. All went well during this ride—my legs felt strong but worked, I was able to relax, the temperature warmed to a comfortable level (it was December), and I was surrounded the whole way by beautiful scenery. All went well, that is, until the wind hit me like a punch in the face. Visibility was great earlier that day, and the wind was mostly calm. I could see fifty miles to the north along the wide-open expanse of the valley floor, but there appeared to be a haze obscuring the most distant mountains. My attention was repeatedly drawn back to this haze because it was moving closer. As I rode north, it moved south further obscuring the horizon. By the late afternoon, it was easy to see what was approaching, one of Death Valley’s infamous wind storms. I’m slow on my bicycle and even more so when it is loaded down with camping gear. The windstorm, if it had any malicious intent, couldn’t have chosen a better time to try and wipe me out. It was late afternoon. I had already ridden sixty miles and my energy levels were dropping. Home was only a dozen or so miles away but the wind forced me to drop into the granny gear. Then it blew even harder. Sand stung my face and dust irritated my eyes. I felt like I was trying to pedal through water. I gave up riding a few miles from home and started to walk. A dust storm blows across Death Valley. That day was rough, as were many others, but I always felt compelled to go back out. After all, there was a 3.3 million acre national park surrounding me. In many areas of the United States, the winters may be soaking wet or too cold to bicycle. Occasionally those things can combine to make Death Valley a not-so-fun place to ride. The odds of that happening, however, are very much against it. It was an easy choice for me to not bring a car to Death Valley National Park, because I don’t own one. I had lived without a car in remote areas of New Mexico and Washington State before, but still I was a little apprehensive about living and working in Death Valley without the ease an automobile would provide (the supermarket lies sixty miles distant from Furnace Creek). It’s not uncommon to read about a car being a “must have” in order to visit and explore Death Valley. For typical national park visitors, this is true. However, I don’t consider touring cyclists to be typical visitors. Without a car, and on a bicycle, is one of the best ways to experience this park. On average Death Valley is the hottest and driest place in the United States. The books written about it are full of superlatives describing its extreme heat and changes of elevation. The Badwater Basin, elevation -282 feet, is the lowest dry land point in North America. Telescope Peak, the park’s highest point at elevation 11049 feet, looks right down upon Badwater from its western foothold. Temperatures exceeding 120° F are routine anywhere in the valley during the height of summer. The earth’s second hottest temperature ever recorded, 134° F, was measured at Furnace Creek*. Those are a couple of the most notable features of Death Valley National Park, but during the five months I spent there I discovered that there were many things rewarding to find, and most of those things I would have missed if I hadn’t been riding my bicycle. I would have missed the level of fitness Death Valley propelled me to. I spent the previous winter and summer in one of the flatter portions of Maine. Cycling there kept me fit, but not like Death Valley. When you’re in the valley, especially at Badwater, there’s only one-way to go—up. The easiest way out of the Death Valley is on a road that climbs over 3000 feet in 20 miles. That’s the pass that I tackled first. From there, the roads became more challenging and exciting. Days riding with 4000 feet and 5000 feet of elevation gain, or more, became common. Whether or not I was loaded up with camping gear or out just for a day ride didn’t matter. The challenge was always there. Over the course of the season, I pounded at the roads daring gravity to slow me down. Of course gravity did its job, but with each passing week my legs became stronger, mountain passes became less daunting, and the return trips down those monster climbs became more rewarding. That’s something else I would have missed without my bike, the challenge and reward of it all. How far could I safely ride this day or that? What discoveries does that canyon next to the road offer? I found that some days were devoted to cycling, some were devoted to hiking, and some were devoted to both. I sometimes carried my hiking boots, daypack, lots of water, and trusty bike lock in a couple of panniers. After finding a suitable road sign near a promising destination or hiking route, I would lock my bicycle to the signpost confident that bicycle thieves probably were not perusing the roads. After that, it was just a matter of hiking in. I wandered to some spectacular places on those days—canyons with waterfalls (yes, even waterfalls can be found in Death Valley if you know where to look), mountain peaks, and the ruins of mining operations gone bust. The lack of daylight during the winter months was limiting however, even more so than my energy levels on some days. I would regretfully leave the mountaintop I reached or the deep canyon I was sheltered in only to be surprised by what I could find while cycling back home. Without my bicycle, I would’ve missed the surprises that even the ordinary roadsides offered. It was sometimes as simple as being surprised by how different the land looked under different light, how hard cycling can be when you just don’t feel as energized as you wish you were, or sometimes it was just the simple presence of wildflowers that surprised me. Obviously, Death Valley is a very dry place. Furnace Creek averages less than two inches of rainfall per year. Plant life is not abundant. Occasionally though, winter rains can help produce spectacular flower blooms during the late winter and spring seasons. Unfortunately, this wasn’t one of those winters. Hardly any rain fell, even by Death Valley standards. However, some areas did receive a light rain shower or two. Annual and perennial plants will respond to such things in due time. I must admit, I’m a bit of plant nerd and easily get distracted by things such as roadside wildflowers. Still, it may seem oxymoronic to go to Death Valley to see wildflowers, but in the right place at the right time of the year flowers can appear. Along a road I pedaled numerous times, light rain had fallen months before. When I came back that way early in March, I was surprised to see the diversity and results of that rain. That day I was sailing down the road on its 6% grade until I noticed the scattering of flowers along the shoulder. I was distracted and surprised enough by them that I barely covered a mile in the next hour. These flowers didn’t produce much along the lines of lushness, but the land no longer felt as desolate as before. I couldn’t say the same for other areas of the park. “No Services Next 54 Miles.” “No Services Next 72 Miles.” These were some of the road signs I encountered in the Death Valley region. Remoteness and desolation were in no short supply, and that’s part of why people are fascinated with this place. Other than roads, Death Valley has very few developed areas. Yes, there certainly are the typical campgrounds, restaurants, and trinket shops one expects to see in a national park, but the lack of water mercifully limits these services to a very limited number of places. Away from those places, nothing seems to stop the desolation and expansiveness of this place. The Harrisburg Flats, which the Emigrant Canyon Road crosses, was once the site of a thriving mining community, and like most mining towns in the area it went bust. Now, not much more than rusting tin cans scattered amongst the low shrubs reveal the town’s location. This area, with its evidence of people come and gone and its lack of people today, filled me with the sense that this is about as lonely and desolate of an area as I’ve ever visited. I cycled up the long haul through Emigrant Canyon for miles and miles to this point with only a handful of automobiles passing by. When I reached the Harrisburg Flats, ten then twenty minutes came and went between cars. I was alone. The old tin cans didn’t offer any company and neither did the northern harrier and the golden eagle I spotted flying nearby. This certainly was a desolate spot, but a blissful one as well. If I had reached this spot in a car after an hour of driving, instead of several hours of pedaling, the emotion of the moment would have been lost. It’s a moment I sometimes think about when streets are crowded and society is noisy. A lot would be lost without exploring this park on a bicycle. Even the wind added to the experience. The same wind that forced me to walk my bike and flung dirt in my eyes and mouth made plenty of noise. It howled through the edges of the doors and windows of my home. It roared across my ears when I cycled drowning out almost all other sound. But when the wind quit, which it often does (trust me), the silence of Death Valley took over. During one wonderfully calm day, in the midst of a ride that climbs a vertical mile from Furnace Creek to Dante’s View, I was fortunate to discover just how quiet Death Valley really is. Few cars had passed by me that day in November, which certainly was welcome. However, it wasn’t the lack of cars that I discovered that day. What struck me the most was the immense silence. As I ascended the last few miles to Dante’s View, I only heard two things: the sound of my tires gripping the pavement and my heart pounding in my chest. After I stopped and rested, I didn’t even hear those things. Looking into Death Valley from Dante’s View. Minus forests, abundant streams, and maybe a conveniently placed bicycle shop, Death Valley offers all a cyclist could want. Ascents of challenging mountain passes, the land’s vast and subtle beauty, the isolation and desolation, the new discoveries, even the wind—it was always these things that brought me back out to ride again. You can even find trees and water if you look for them. Would I have experienced all of these things if I was traveling by automobile? Possibly. Would they have been as fulfilling? Never. The views were never as grand, the flowers never as pretty, and the wind never blew as hard as it did when I was riding my bicycle. *This is now considered the hottest temperature ever recorded on Earth. Northern elephant seals are one of the largest pinnipeds on Earth. Large males can weigh as much as an SUV—four to five thousand pounds. Females are much smaller, topping off at only about one thousand pounds. Since the first few pairs began to haul out at Point Reyes in the 1970s, more and more have arrived each year. A subadult male elephant seal rests on a cobble beach in the Chimney Rock area at Point Reyes National Seashore. This aggregation is a seasonal event. Unlike many mammals, the birthing and breeding season coincide in elephant seals. Males arrive first, establishing beach front territory where they’ll be able to establish and protect a harem. Pregnant females show up next, after which they soon give birth. Pups are weaned after about a month of nursing. Like bears, female elephant seals fast while giving birth and nursing. They do not eat, drink, or leave the beach during this time. Consequently, they lose 30-40% of their body weight during this short time. Mating occurs before the females depart to the open ocean. Adult males stick around longer, aiming to increase their chances of mating with as many females as possible. Males have unique individual calls, and helps them recognize each other and avoid some physical conflict. While my mid January visit was too brief and my viewing was too far away to make such differentiations, there was plenty of activity to see and hear. The biggest bulls already had established territories and harems. Newborn pups cried nearly constantly, especially when a wave of cold water washed over them. Females barked at each other too. For gregarious creatures, they sure let others hear it when their personal space is encroached upon. The main overlook provided the best viewing opportunity to see bulls with harems. The females didn’t seem to be ready to mate, having just given birth or just about to, but that didn’t stop some of the bulls from trying. Forced copulation is not uncommon among elephant seals. Females can be seriously injured and pups crushed by randy males. I also found good viewing opportunities nearby at the old U.S. Life Saving Station. Northern elephant seals were once thought to be extinct from decades of unrelenting and unregulated hunting, then a small population was found off of the Mexican coast in the early twentieth century. Luckily, the species was given strict protection while their ocean habitat remained largely intact, and their population has grown about six percent per year since the early twentieth century. There are now probably more than 150,000 northern elephant seals. Many marine mammal species were once so rare that we can’t take them for granted, and we need to ensure their habitat and food sources are protected. If you’re in the neighborhood of Point Reyes National Seashore in January and February, you must stop and see elephant seals at Chimney Rock. 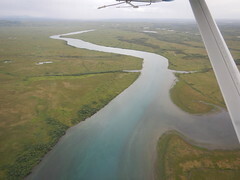 Katmai National Park and Preserve is a place of unparalleled resources. It’s studded with over a dozen active volcanoes and protects the site of the largest volcanic eruption of the twentieth century. 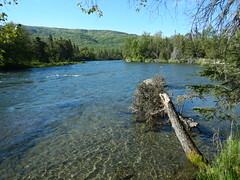 Its lakes and rivers are swarmed annually by millions of salmon. Abundant food and an undeveloped landscape provides habitat for over 2,000 brown bears, more than any other national park. For 9,000 years people have made it their home, adapting to the landscape’s constant change and challenges. Mount Griggs towers behind Baked Mountain in the Valley of Ten Thousand Smokes. As a park, it’s very remote and expensive to experience. Its coastline, measuring over 400 miles, and almost all of the rest of the 4.1 million-acre park remain roadless. 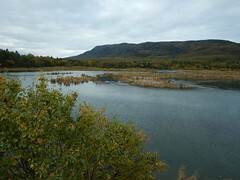 For nearly a century after its establishment, Katmai was only accessible to people who could afford to visit and were physically capable of doing so. Webcams (bearcams) changed that. Webcams allowed Katmai National Park to democratize itself, providing audiences all over the world with meaningful opportunities to connect with the park, especially its bears, and build stewards on a global scale. Survey results* indicate watching the bearcams increased viewer interest in Katmai and wildlife conservation, and viewers’ interest in national parks and wildlife conservation is on par with on-site visitors. Essentially, webcams can inspire stewardship on the same level as a physical visit to a park. They are powerful interpretive tools with great potential to increase awareness, understanding, and stewardship of wildlife and conservation areas. Yet, national parks rarely utilize webcams to their full potential and online audiences are either ignored or deemed secondary to on-site visitors. This needs to change. Bear 708 Amelia sits on a rock–a typical scene on Katmai’s webcams. Inspired by the success of Katmai’s webcams and to communicate the need to utilize them in more places, I’ll be leading a session at the 2017 National Association of Interpretation Conference. Roy Wood, Katmai’s former Chief of Interpretation and the current Chief of Interpretation and Education at Shenandoah National Park, and Ryan Sharp, Assistant Professor of Park Management and Conservation at Kansas State University will join me. Roy and I will discuss our methods to interpret bears, salmon, and other park resources to online audiences. Ryan will present survey results exploring the online bear viewing experience at Katmai and its influence on support for bear conservation and management. If you’re interested in watching but can’t attend, don’t worry. A presentation about Katmai’s bearcams wouldn’t be complete if it wasn’t streamed live on bearcam. That’s why I made tentative plans with explore.org, who hosts and funds Katmai’s webcams, to live stream the presentation. The session begins at 10:45 a.m. PT on November 16. In the age of internet and social media, traditional interpretive programs catering solely to on-site visitors (through guided walks, ranger-led talks, slide shows, etc.) are no longer adequate to build and maintain widespread stewardship for parks and other conservation areas. When I worked at Katmai National Park, I was amazed, awestruck really, at the reach and effectiveness of the bearcams. Nearly everyday, I could find evidence of people connecting in meaningful ways with Katmai’s wildlife. Katmai is better protected today than it was even ten years ago due to the awareness and understanding its webcams have brought to people around the world. The bearcams annually reach tens of millions of people worldwide. With effective interpretation, webcams consistently and positively engage viewers, increase public awareness and stewardship of wildlife, expand messaging to pre and post on-site visitors, and extend interpretive messages to audiences worldwide. Existing technology now provides conservation organizations with the ability to reach people all over the world, not just those who are fortunate enough to visit. We need more webcams and more rangers on them. This is how parks take their message to the world. Update (Nov. 17, 2017): A replay of my presentation is now online. Download the slide presentation in PowerPoint (199 MB) or Keynote (127 MB). *Sharp, Ryan, J. Skibins, and J. Sharp. Online and onsite brown bear viewing: Influence on visitors’ support for conservation-based management at Katmai National Park and Preserve. 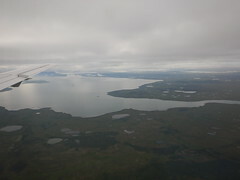 Unpublished Report to Katmai National Park and Preserve. Kansas State University. Jan. 23, 2017.